UFC Personal Trailer XBox 360 Review It is difficult to recommend this to anyone who doesn’t fit what I just described or who has played the other exercise titles and just needs more. Overall, this is a fairly disappointing title where a lot more could be done with the excellent licensing opportunities. The rise in popularity of motion controls has also seen a rise in exercise games designed to get you up off the couch and moving around while you enjoy your favourite hobby. UFC Personal Trainer is the latest addition to the ever expanding list of exercise based titles. UFC Personal Trainer seems to have a slightly different target audience than many other titles; it seems more aimed at men, that’s not to say that woman won’t enjoy this game though. So this may be a title for those looking to perhaps add some more physical activity to their day or perhaps looking for something different from just going for a run. 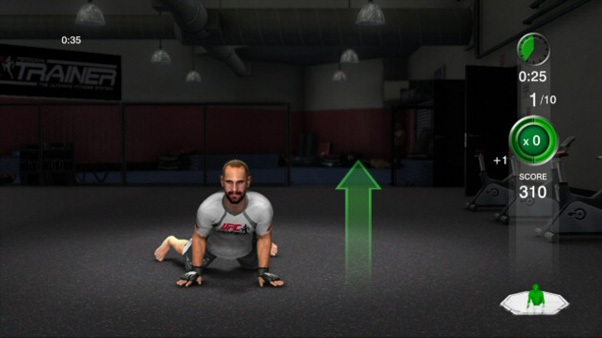 The concept using a personal trainer setup within a kinect game is interesting; it is a good idea but is no substitute for an individually developed and monitored training program. This is where this title falls short, in order for some level of motivation to be achieved the trainers need to be fairly energetic and life like. THQ did go to the effort of getting some official licensing and the real fighters, these guys are not actors though and lack enthusiasm. So the voice work is very bland and they all read from the same script, and often they repeat the same line, seemingly in the same sentence. This can really take you out of the experience and definitely can affect motivation. Having some kicking adds more to the traditional boxing formula. The controls work well enough; it generally picks up all your movements with the occasional missed movement while standing. The kinect sensor did miss a more movements while performing some of the grounds, this is a particular problem if your room is only just large enough to use the kinect. For this title you will definitely want to have plenty of space in your room as some of the more advanced may cause a loss of balance or moving a bit more than planned. There is certainly a lack of appropriate warm-ups and cool downs, this can be very important for people, and as this game is targeted at non-athletes who may not know their limits erring on the side of caution would have been a bit better. There are a nice range of exercises featured, I liked that there was some variation in the traditional boxing style; there are some uppercuts and they even get the knees going. 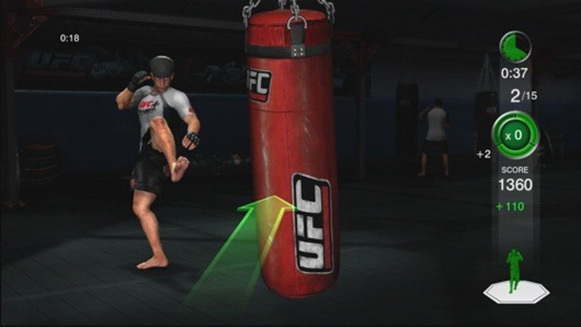 This is probably the major benefit that you will find with UFC over other exercise games. There are some more advanced movements featured that will elevate your heart rate but they unfortunately just lack the enjoyment that some other titles achieve through more interesting visuals and challenges. The graphics in this game are just plain average, the character models are not outdated per se, there is just something about them that is not up to the standard it should be. The movements are fluent enough but if this weren’t the case the game would feel completely broken. The biggest issue is that the environments that the trainers are in are just plain boring, and there is no variation between each one, they are bland and feel lifeless. This can take you out of the experience and could greatly affect how long you stick at it. You may look a bit silly doing this. I have no doubt that it would be possible to achieve some weight loss, fitness gains or possibly strength through using this title religiously, the interface, lack of motivation and general interest in the title itself will see this happen. If you love UFC and want something to get you off the couch, at least for a short time then this may be worth a purchase. It is difficult to recommend this to anyone who doesn’t fit what I just described or who has played the other exercise titles and just needs more. Overall, this is a fairly disappointing title where a lot more could be done with the excellent licensing opportunities.